The members of perennial A.V. Club favorite Tokyo Police Club are such nice guys that they’ve come by to cover Bill Squier’s “Everbody Wants You,” played Bozo’s Grand Prize Game with staffers, gave us the exclusive on a couple of covers they recorded last week—Phoenix’s “Long Distance Call” and LCD Soundsystem’s “All My Friends”—and are set to play A.V. Fest this Sunday. Those two covers are part of a project the band just wrapped up, where members sequestered themselves in L.A.’s Red Bull Studio and committed to recording one cover a day, with each song coming from a different year in the aughts. Seeing as how The A.V. Club is clearly a fan of solidly executed covers, it seemed only right to talk to TPC’s Graham Wright not about his band’s original material or his solo record—Shirts Vs. Skins, released earlier this year—but, rather, about other people’s songs. The A.V. Club: So what inspired this current project? Graham Wright: We’ve done covers in the past, but really we were just looking for something to do. We don’t have songs to make a new record, and we’re kind of done with Champ. You have to do something so people don’t forget who you are, and we’d gotten ideas from labels, publicists, and managers about things we could do. A lot were really stupid, but this idea had been floating around in a few different versions since the beginning of the year. It just kept sticking around for whatever reason, and it made sense. It was just very natural for us to do. AVC: It’s not just an A.V. Undercover rip-off, then? GW: [Laughs.] Doing covers is really nothing new. 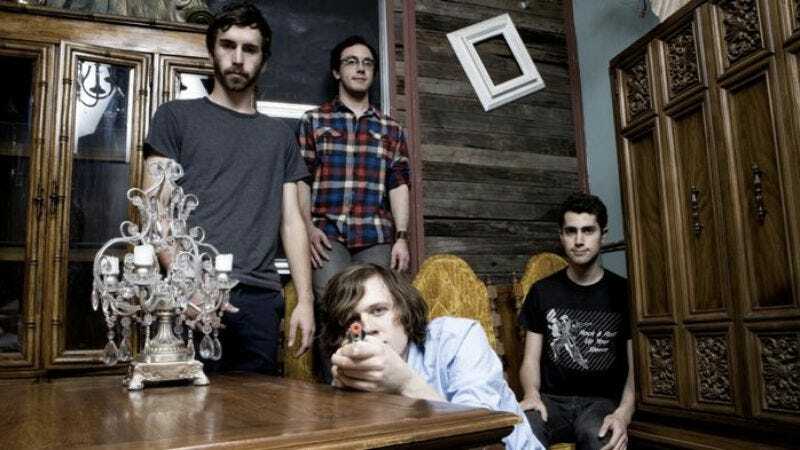 We did Undercover, sure, but a lot of bands like Okkervil River have put out cover mix-tapes online and stuff. It’s not an earth-shaking, surprising development. The purpose is just to get people to pay attention. AVC: What was the reasoning behind doing one song for each year? GW: You have to do something that sets it apart. Limitations are fun, like if we just said, “We’re going to do 10 covers of any songs,” that would be fine, but we’ve covered a lot of songs in the past. We’d have to say, “We’re not going to do ‘American Girl.’ We’re not going to do ‘Friends Of P,’” and whatever else we’ve covered in the past. Also, this was the exact period of music we were listening to as a group: 2000 is the year I got into “good music.” Before that, I was listening to bad music. So, to do covers from this time period is a fun nostalgia trip through the music of our youth. AVC: What makes a good cover? GW: It depends on the scenario. We’ve covered songs like “Last Night” by The Strokes and [Weezer’s] “My Name Is Jonas” on tour, and there you just play the song the way people know they like it. No one is calling you back out for an encore because they’re excited to hear your interesting new take on a song they know and like. But for something like this, something on the Internet, it’s boring for us to come out and release 10 note-for-note covers of songs. That’s not something interesting for listeners, and it’s not exciting to record. It’s fun to do things exactly how they were done live, because you can pretend to be The Strokes, or whoever, for a minute. But, for this kind of thing, you have to find a way to do something exciting with the song while not completely removing what it was that made it good in the first place. You have to have irreverence and reverence. AVC: Have you ever tried to play a cover as a band that just didn’t work out? GW: A few years ago—Dave [Monks, vocalist-bassist] would kill me if I told this, but he’s not here, so I’m going to—anyway, there was this clothing company that was doing a back-to-school commercial, and they solicited covers of “Don’t You Forget About Me.” We went into the studio and recorded a cover with more irreverence than reverence, and it didn’t get picked. I would say that’s for the best. We tackled it, but it’s locked away somewhere in the Disney vaults forever. AVC: What haven’t you covered that you want to? GW: Dave and I were talking in the car on the way to the studio about this. Dave wants to do The Damned’s “Neat Neat Neat,” which was produced by Nick Lowe. Dave recorded a cover of it at home, testing some equipment, and I think that would be really neat for us to cover as a band. There’s tons, really, but we can’t think about that now. We’re music lovers, which shouldn’t come as news to anyone in a band, because if you’re in a band, you love music. You never quite get over that little kid inside of you who would air guitar to songs they love in front of the mirror. You’re just living that in a more realistic way in front of an audience, and ultimately that makes the idea more appealing. I always want to try other covers. I just don’t know how often I want to go into the studio and do it, but playing them live is always fun. AVC: What are some of your favorite covers of all time? GW: One of my favorite covers, and I’m not familiar with the original song or the artist at all, but last year Thom Yorke and some other people did that tribute CD for Mark Mulcahy. I’m a big Radiohead fan, so I downloaded the Thom Yorke one, and I think it’s the best thing he’s released in a while. It’s this beautiful, melodic pop song that Thom Yorke doesn’t really write anymore, plus the beautiful, glitchy Radiohead style. I also like “Twist And Shout” by The Beatles. That’s a cover, and it’s a great song. If you’d told me it was theirs originally, I would have believed you.